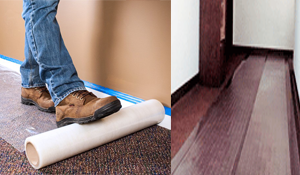 Find a full line of carpet shield temporary floor protection and other carpet cover products. Our products for floor protection during construction ship fast, so you do not hold up a project. We even sell durable clear vinyl carpet runners in three widths, sold by the foot so you can get the exact length you need. Not just hardwood flooring protection, find laminate, tile, and other hard surface covers too. Hard to find breathable floor protection you can use on site finished hardwood floors. The popular multi surface protection film is an inexpensive temporary floor protection. 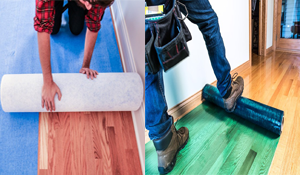 Find a hard surface and hardwood floor protectant that works for you. Disposable shoe covers (booties), floor tape, adhesive sticky mat, and more. Lay down floor protection films in large areas with out easy to use applicator rollers. 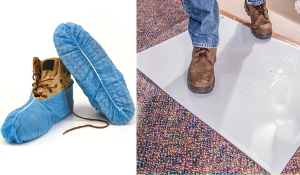 Flooring protection is easy to implement with these floor protectors. Move heavy furniture easily with our full selection of furniture sliders. 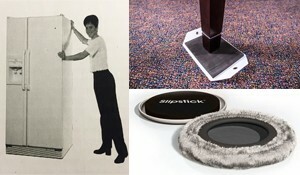 Surface sleds for carpeted floors and hard surface floors. We even have a heavy duty appliance mover for easy location changes for ovens, refrigerators, and other appliances.